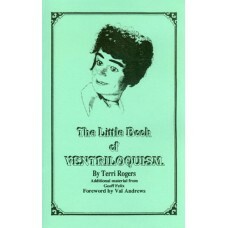 Terri Rogers was an amazing ventriloquist...not only was she technically skilled, she was a creative genius. Her creations for magicians are well-known around the world. The world of entertainment lost her - as well as her little friend "Shorty Harris" - all too soon. This little volume is Terri's legacy to her fellow vents everywhere. While small in size, the information contained in it is priceless. Terri had a way of packing in lots of valuable information in an economy of pages. You'll get ideas from this booklet that you absolutely won't find elsewhere. Much more than just a simple "how to" booklet, this is a manual of “how-to” advice from a professional's perspective. Terri was one of the best, and it always pays to listen to those who lead the way! “The Little Book of Ventriloquism” features a Foreword by Val Andrews and additional material from Geoff Felix.